August is the month of endless summer days, which is inevitably coming to a close. It should fly by, like all good things do, but August seems to stick with me. It stews and simmers and permeates the air, like the smell of something that has been cooking away for hours on the stove, reaching every nook and cranny of my memory. Every part of me wishes I could bottle up the elation of catching fireflies, the rush of wind on my face as I sway ferociously on a tire swing, and the tiny squeal I still make whenever I catch a fish. I would put them on a shelf to enjoy all year long, if only that were possible. Perhaps I need to look elsewhere to preserve my blessed summer. So, with the need for stability and encouragement in life, I find my way to the kitchen, securely tie my apron strings and get to work in upholding summer my way. And by that, I mean canning (or “puttin’ up” as we say in the South) but without using the traditional canning methods. I want a quick, spicy pickle that has been marinated in gloriously gleaming oil with fresh herbs. Within moments into the pickling process, the air is sour with the hum of vinegar so thick that it permeates every nook and cranny of my home. And so it should, I am preserving August after all. Note: Pickling watermelon rind in habanero sauce brings out this amazing smoky and sweet combination that is heavenly. Now, you can half the amount of habanero sauce in the recipe if you want a more mild heat. Also, I sterilize my Mason jars in the dishwasher on a high heat setting. Just don’t touch the inside of the jar or the lid after they come out the dishwasher and desterilize the jars! After you have placed a lid on the pickled rind and placed them in the fridge, the oil from the marinade will solidify slightly. That is completely fine. Just place the jar on the counter and let it come to room temperature before digging in! Combine canola oil and mint leaves in a large mixing bowl. Set aside. Place water, vinegar, salt and habanero sauce in a small saucepan and bring to a boil. Add the watermelon rind and boil in the pickling liquid for 3 minutes. Using a slotted spoon, lift the watermelon rind out of the pickling liquid and transfer into the marinating liquid (don’t completely drain the rind, allow some of the pickling liquid to go into the marinade as well.) Immediately, transfer the watermelon rind and marinating liquid to a sterilized Mason jar, tightly stacking the pickled rind into the jar. Make sure the liquid covers the rind and screw the lid on tightly. Set aside to cool and place in the fridge. 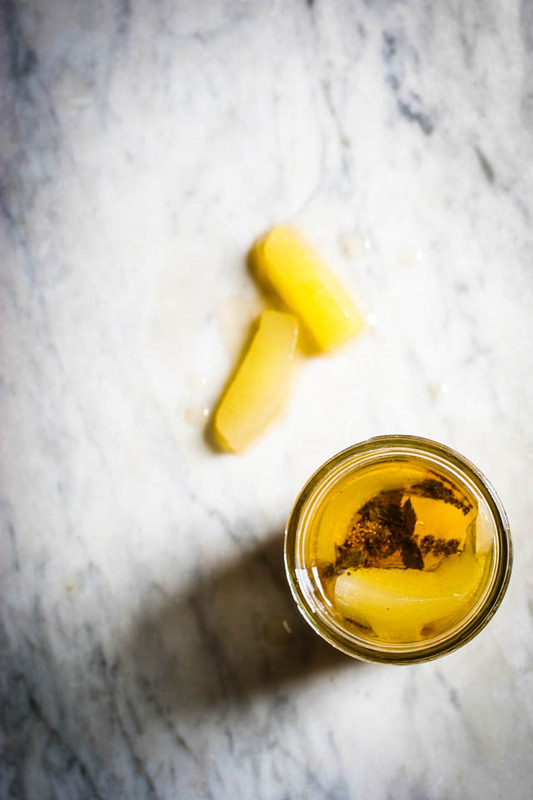 The pickled rind will last for a week stored in the fridge, or you can eat them immediately! Note: The peppery notes in the Tabasco Green Jalapeño sauce compliments the grassy notes of the okra in a lovely, subtle way. Also, I sterilize my Mason jars in the dishwasher on a high heat setting. Just don’t touch the inside of the jar or the lid after they come out the dishwasher and desterilize the jars! After you have placed a lid on the okra and placed them in the fridge, the oil from the marinade will solidify slightly. That is completely fine. Just place the jar on the counter and let it come to room temperature before digging in! Combine olive oil, garlic and red pepper flakes in a large mixing bowl. Set aside. Place water, vinegar, salt and green jalapeño sauce in a small saucepan and bring to a boil. Add the okra and boil in the pickling liquid for 3 minutes. 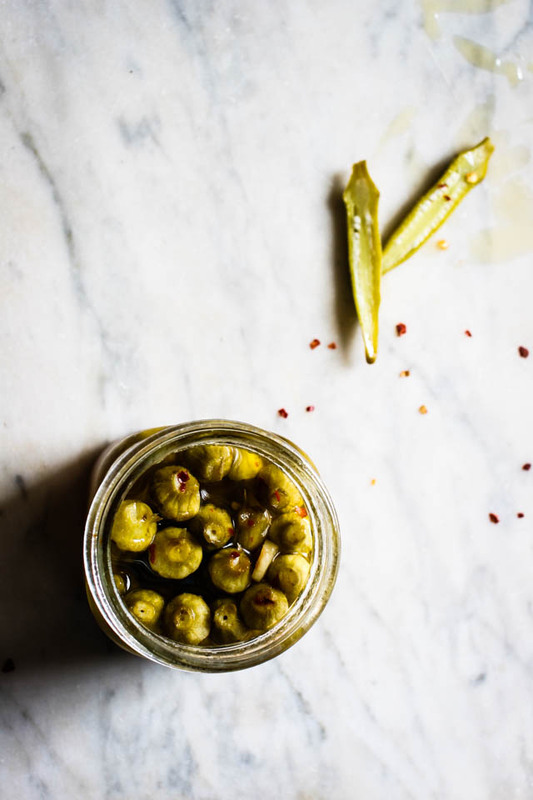 Using a slotted spoon, lift the okra out of the pickling liquid and transfer into the marinating liquid (don’t completely drain the okra, allow some of the pickling liquid to go into the marinade as well.) 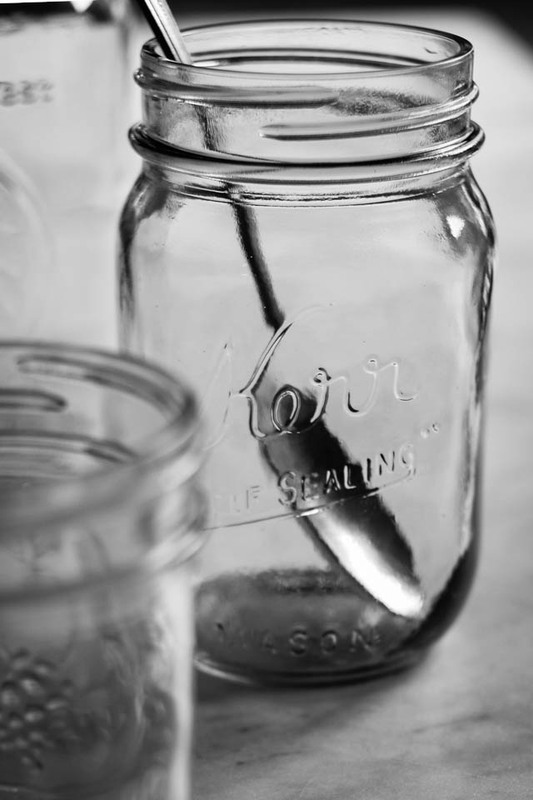 Immediately, transfer the okra and marinating liquid to a sterilized Mason jar, tightly stacking the pickled okra into the jar. Make sure the liquid covers the okra and screw the lid on tightly. Set aside to cool and place in the fridge. The pickled okra will last for a week stored in the fridge, or you can eat them immediately!